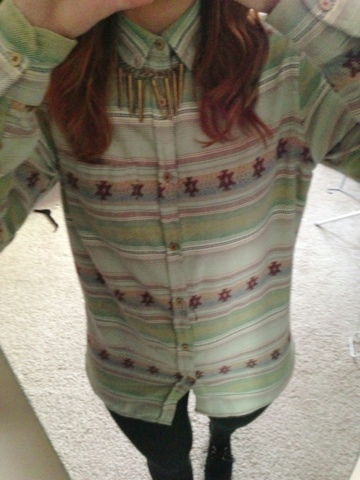 This is what I wore on Sunday for a day moochin around town, doing a little bit of shopping and visiting family. I also made a lemon drizzle cake successfully! Yey! It went down a storm with the family. The shirt is the boyfriend’s, I bought it him for Christmas. It doesn’t fit but he didn’t tell me this until a few months after so I was unable to return it. Aaand so I have appropriated it and now it shall be mine and I shall wear it. The leggings were a gift from my mum, I’m not sure where they are from and my creeps are from eBay. The bag is from boohoo and my necklace was another ebay find.